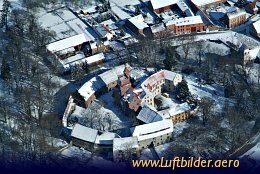 Although most of the buildings in Altenhausen Castle were built in the Late Middle Ages or in Modern Times, the outermost ring buildings give the impression of a complete medieval castle. The castle was first mentioned in 1303. After beeing possessed by different noble families, the family of Schulenburg aquired the property of Altenhausen castle and lived there between 1485 and 1945.